After a frantic week one on the women’s side of the draw we have reached the latter stages of the US Open. The story of the first week can be summed by one word: Dramatic. The draw has been dissected with many of the top seeds bowing out in the first week. It all started with Maria Sharapova’s withdrawal due to a leg injury and from there they all came tumbling down. Only Serena Williams, Simona Halep, and Petra Kvitova remain out of the top 10 seeds. The early exits have opened the draw for some unexpected names in round four. So it is sure to be an interesting week ahead. It is quite possibly the headline act of the fourth round as Serena’s quest to make history hits a tricky obstacle in the form of Madison Keys. The world number one has not exactly looked her awesome self thus far but it has been enough to see off all challenges. An injured Vitalia Diatchenko could not win a game as she eventually retired in the second set in the opening round. Kiki Bertens served for the opener against Serena but eventually would lose 7-6(5), 6-3. Bethanie Mattek-Sands would be the first to take a set off the top seed in their night session match but as usual Serena would come back to win in three sets. Madison Keys’ road has been very straight forward thus far. The young American has not dropped a set thus far, including an impressive display in the third round against Agnieszka Radwanska. It was be a battle of brute force and power as these two both hit the ball extremely hard. Serena holds the win in their only previous victory in Melbourne this year 7-6(5) 6-2. The 20 year old’s power will pose plenty of problems for the world number one, but I expect Serena’s experience to pull her through another tough test. One of the unexpected names at this stage is Kontaveit, who has come through qualifying to make it to this stage. The Estonian took advantage of Karolina Pliskova’s early exit and has dropped only one set (to Madison Brengle) so far, including a straight sets win over Anastasia Pavlyuchenkova. No doubt her biggest so far though is Venus Williams, who is looking to set up a potential Williams sisters clash in the quarter finals. After struggling through her opening two rounds, the former champion was impressive in defeating an in form Belinda Bencic in round three. The qualifier has done well to make it this far but anything but a Venus victory will be a big shock. The 35 year old has far more experience at this level and nerves will likely factor in Kontaveit’s performance. The withdrawal of third seed, Sharapova, had opened this section up for a potentially unexpected deep run. Compatriot Makarova could be the biggest beneficiary of Sharapova’s injury as she looks to re-find the form that saw her break the top 10. The Russian always brings her bets to the big events and so far this one has been no different. Telina Peireira, Lauren Davis and Elina Svitolina have all been dispatched in straight sets as the 13th seed bids for her second straight semi final. Talented Frenchwoman Mladenovic is seeking her first grand slam quarter final here. She has also advanced to this stage without dropping a set, including defeating former champion Svetlana Kuznetsova. It will likely be a closer battle for both of them than their previous round matches. Their only two meetings have been tight three setters which both went the way of Makarova, so I am going to predict something similar here. After months and months of losses, Bouchard has finally found some form. It has not been an easy ride for the Canadian as she has had to battle through two three setters in a row. Bouchard overcame Ana Ivanovic’s slayer, Dominika Cibulkova in an impressive victory in the last round. Vinci provides a much different challenge than any Bouchard has faced so far. The Italian is a rare single hander and has a very deadly slice. The Italian has continued her good form in this tournament, but she has also been made to work with back to back three sets wins. Both will be a surprise quarter finalist here, but Vinci did make a very good run in 2012. I can see her slice causing Bouchard a whole lot of trouble, and if their previous meeting is anything to go by it could be a tough match for the Canadian. 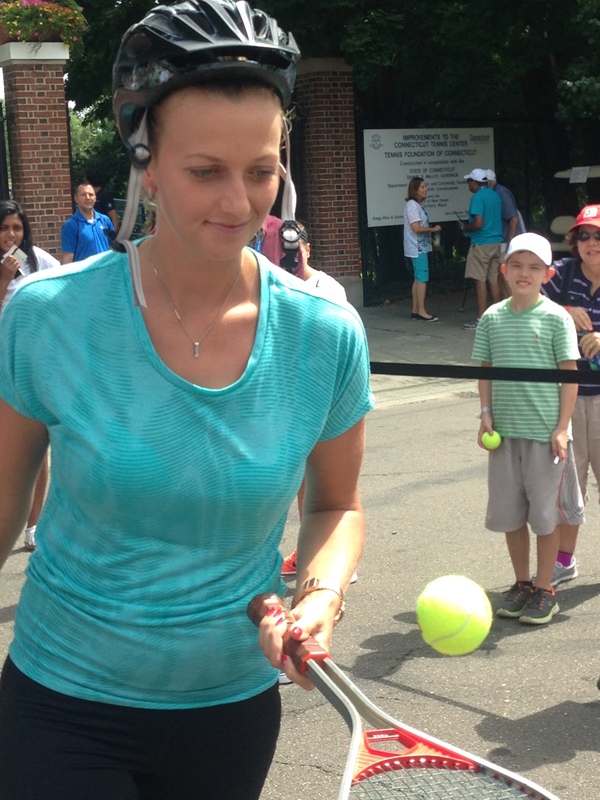 Despite the mono scare, Fifth seed Kvitova has found some form as of late. The Czech has backed up her New Haven title win by reaching the fourth round without dropping a set. Anna Schmiedlova was the latest victim in round three. The form of Jo Konta has been one of the talking points of the tournament. The Brit is riding a 16 match win streak heading in to this match and will achieve a career high ranking after the tournament has finished. She dismissed Louisa Chirico in round one, battle past Garbine Muguruza in round two and overcame Andrea Petkovic in round three. Can she claim the scalp of Kvitova? With the Brit’s form and Kvitova always capable of putting in a horror show we could very well see an upset (again). However the smart money is on the Czech ending the fantastic run of Konta, possibly in straight sets. Former champion Sam Stosur is looking to re-kindle her 2011 glory here, and it has been so far, so good for the Aussie in the first week. She came through the opening two rounds in straight sets before being pushed by 16th seed Sara Errani in round three. Petra Cetovska’s upset over Caroline Wozniacki opened the door for Flavia Pennetta to make the fourth round. The Italian was the one to send Cetovska packing in round three after defeating Monica Niculescu and Jarmila Gadjosova in her opening two matches. Interestingly, this head to head is lopsided at 6-0 to the Italian. However Stsour evidently loves these courts and I feel she might claim her first victory over Pennetta here. Bidding for her first US open title after losing back to back finals in 2012 and 2013, Azarenka fought her way through the ever present Angelique Kerber in round three in arguably the match of the tournament thus far. Prior to that Vika had not dropped a set in her opening two rounds, so she is in good form heading in to this one. The fourth and final American to make it to round four is Varvara Lepchenko, who is another surprise name at this stage. Lucie Safarova feel flat against Lesia Tsurenko who in turn did the same against Lepchenko in the following round. A tough battle against Mona Barthel followed, but the American came from a set down to win on that occasion. Azarenka will be the favourite, but if the home crowd can rally behind Lepchenko who knows what will happen? I expect the Belarusian to be too solid for the American and book her place in the quarter finals. Halep has looked like how a second seed should thus far, totally dominant. She has not dropped a set in her first three rounds as she bids for her first grand slam title. Marina Erakovic was forced to retire in round one, but aside from that her opponents have been brushed aside. Lisicki has had a slightly more dramatic passage to this stage. The German came from 5-1 down in the third set to defeat Barbora Strycova in round three after back to back straight sets wins to open the tournament. This is Lisicki’s best ever run at Flushing Meadows. If the German’s serve is firing it will be a really tough match for Halep in these conditions. But aside from that Lisicki will have to play well from the baseline if she to stand a chance. Halep will likely remain consistent and weather the storm to pull through. Serena def. Venus in 2: When the sister collide in the quarter finals it will capture the eyes of the world. I just believe at this stage Venus won’t have enough to defeat Serena in a grand slam. Makarova def. Vinci in 2: It is a quarter final which we didn’t expect when the draw was made. Like mentioned above Makarova brings her A-game to the slams, and I see her coping with the pressure and Vinci’s variety to pull through. Kvitova def. Stosur in 3: This one could be great or a complete mess. Either way these two should play a close one here but I feel Kvitova’s forehand will expose the backhand side of the Aussie. Halep def. Azarenka in 3: This one could potentially be a classic war. Both play fairly similar styles and will fight until the last point, but I predict Halep to be in better form and prevail in three. Serena def. Makarova in 2: A repeat of their semi-final last year. I feel Serena will be clicking at this point and will dispatch a game Makarova in straight sets as she bids for her calendar year grand slam. Halep def. Kvitova in 2: Halep has played some excellent tennis so far and I expect her to continue that in to the latter stages of the tournament. Kvitova’s illness could play a part at this stage and she could be tired after three straight weeks of playing. I am sticking to my pre-tournament guns and saying that the final will see Serena take on Halep. The Romanian has troubled and beaten the world number one in the past but has never managed it at grand slam level. I feel Williams will win the first set fairly comfortably as she continues her form from the previous rounds. However in the second she will start feeling the pressure and nerves will kick in. Halep as a result will take the second and push the world number one to the brink in the third, only for Serena to fight her way to victory and a 22nd grand slam title.